English Cottage house designs are characterized by an overall cozy, warm and inviting feeling. With origins in western England dating back to Medieval times, the fairy-tale style of English cottages became popular in America between 1890 and 1940. The exterior of these English cottages typically boasts steep gables, hip roofs with shingles, stone or stucco siding. The unique, asymmetrical designs usually feature one and a half story floor plans with many interior design elements including artistic nooks and niches. Designed for families and empty-nesters alike, if you’re looking for a home with picturesque style, look no further than English Cottage home plans. 1777 Sq. Ft., Width 30'-0", Depth 51'-0"
The Steinhoff Luxury European Home has 4 bedrooms, 3 full baths and 1 half bath. 3602 Sq. 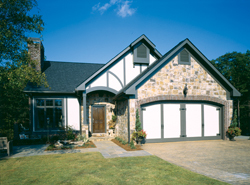 Ft., Width 60'-0", Depth 59'-6"
The Bambury Tudor Craftsman Home has 3 bedrooms and 2 full baths. 1938 Sq. Ft., Width 61'-0", Depth 78'-0"
3732 Sq. Ft., Width 85'-11", Depth 62'-2"
2546 Sq. Ft., Width 54'-4", Depth 73'-4"
The Rompelle European Home has 3 bedrooms and 2 full baths. 1713 Sq. Ft., Width 58'-9", Depth 47'-4"
The Wyndcrest Craftsman Home has 3 bedrooms and 3 full baths. 2054 Sq. Ft., Width 55'-0", Depth 57'-0"
English Cottage house designs encompass neverending charm and coziness often associated with this charming style. These cottage floor plans are perfect for downsizing, building a unique home with a lot of character, or capturing by-gone days in the modern day. See a wide variety of cottage designs and options, so you can find a home design with a look and feel you love. These houses are known for being unique, and with our wide selection of floor plans, we are sure that you will find the plan to fit your needs.